What is the Fourier Transform? In this tutorial we are going to create a JavaFX application where we can load a picture from our file system and apply to it the DFT and the inverse DFT. 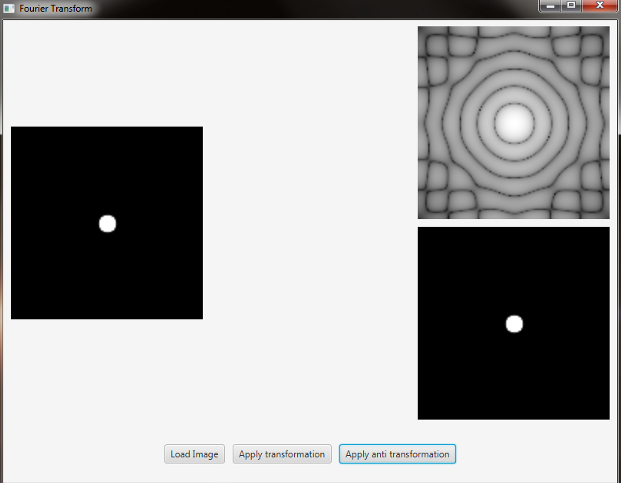 The Fourier Transform will decompose an image into its sinus and cosines components. In other words, it will transform an image from its spatial domain to its frequency domain. The result of the transformation is complex numbers. Displaying this is possible either via a real image and a complex image or via a magnitude and a phase image. However, throughout the image processing algorithms only the magnitude image is interesting as this contains all the information we need about the images geometric structure. For this tutorial we are going to use basic gray scale image, whose values usually are between zero and 255. Therefore the Fourier Transform too needs to be of a discrete type resulting in a Discrete Fourier Transform (DFT). The DFT is the sampled Fourier Transform and therefore does not contain all frequencies forming an image, but only a set of samples which is large enough to fully describe the spatial domain image. The number of frequencies corresponds to the number of pixels in the spatial domain image, i.e. the image in the spatial and Fourier domain are of the same size. Load an image from a file chooser. 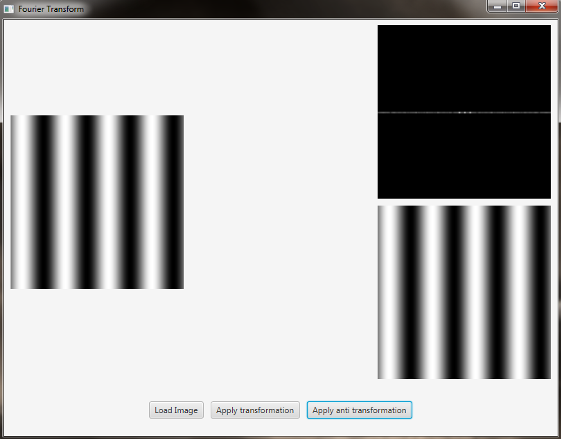 Apply the DFT to the loaded image and show it. Apply the iDFT to the transformed image and show it. on the BOTTOM three buttons, the first one to load the picture, the second one to apply the DFT and show it, and the last one to apply the anti-transform and show it. The appended pixels are initialized with zeros. The image is a horizontal sine of 4 cycles. Notice that the DFT just has a single component, represented by 2 bright spots symmetrically placed about the center of the DFT image. The center of the image is the origin of the frequency coordinate system. The x-axis runs left to right through the center and represents the horizontal component of frequency. The y-axis runs bottom to top through the center and represents the vertical component of frequency. There is a dot at the center that represents the (0,0) frequency term or average value of the image. Images usually have a large average value (like 128) and lots of low frequency information so FT images usually have a bright blob of components near the center. High frequencies in the horizontal direction will cause bright dots away from the center in the horizontal direction. In this case we have a circular aperture, and what is the Fourier transform of a circular aperture? The diffraction disk and rings. A large aperture produces a compact transform, instead a small one produces a larger Airy pattern; thus the disk is greater if aperture is smaller; according to Fourier properties, from the center to the middle of the first dark ring the distance is (1.22 x N) / d; in this case N is the size of the image, and d is the diameter of the circle. An Airy disk is the bright center of the diffraction pattern created from a circular aperture ideal optical system; nearly half of the light is contained in a diameter of 1.02 x lamba x f_number.